Hamas, a former ally of Assad, is now training the rebel Free Syrian Army in eastern Damascus, sources tell the British Times. Hamas, a former ally of Syria's President Bashar al-Assad, is now training the rebel Free Syrian Army in eastern Damascus, according to a report Friday in the British Times. Diplomatic sources told the newspaper that members of Hamas’s Ezzedine al-Qassam Brigades were training FSA units in the rebel-held neighborhoods of Yalda, Jaramana and Babbila. The development confirms that Hamas, the terror group that runs Gaza, has broken with its former Syrian host and fully embraced the patronage of Qatar, a major financial and logistical backer of some rebel factions. 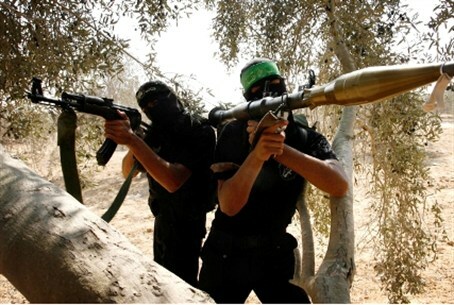 "The Qassam Brigades have been training units very close to Damascus. These are specialists. They are really good," a Western diplomat with high-level contacts in the Assad regime and the Syrian opposition who visits Damascus regularly told the Times. Other sources suggested to the newspaper that Hamas trainers were helping the FSA to dig tunnels beneath at least one contested area of Damascus. in preparation for a widely expected assault on the city center. A source from the Ain al-Hilweh “Palestinian refugee” camp located in Lebanon told the Times it was common knowledge that a few hundred Hamas terrorists were fighting alongside the FSA in the Yarmouk and Neirab camps in Damascus and Aleppo. Hamas, meanwhile, has vehemently denied any such link. Osama Hamdan, a leading Hamas official based in Lebanon, told the Times, "It's a false thing. There are no members of Ezzedine al-Qassam or any militant members of Hamas in Syria. "We don't interfere in the internal problems of Syria,” he claimed. “Our members there are normal civilians, Syrian Palestinians, who live with their families there. From the beginning of what has happened in Syria, we rejected as a movement any involvement of any Palestinian in the current events in Syria." In the first months of the uprising in Syria, Hamas’s leaders expressed support in principle for the struggle of the Syrian people while also highlighting the importance of the movement’s historical relationship with the Syrian regime. However, as the rift deepened, reports surfaced that Hamas is moving its headquarters from Damascus to Egypt and the terror group is strengthening itself in the Sinai and in Qatar. Some reports claimed that the Damascus-based Hamas leadership left Syria after the Syrian government asked the Hamas leaders to leave. In November, Syrian security forces shut down all the offices belonging to Hamas in the country. The Assad regime has fiercely criticized Mashaal's decision to break with the regime, recalling Damascus's willingness to host the Hamas leader when other regional capitals refused to do so. This week, a Syrian regime newspaper slammed Hamas and its leader, Khaled Mashaal, for breaking with Damascus, accusing them of giving up on resistance against Israel. Hamas has shifted "the gun from the shoulder of resistance (against Israel) to the shoulder of compromise", the Al-Thawra daily said. "Today, as Mashaal becomes the head of Hamas for the fifth time... the West Bank, Gaza and the whole of occupied Palestine have no reason to celebrate," wrote the newspaper. Mashaal "cannot believe his luck. After an acclaimed history of struggle, he has returned to the safe Qatari embrace, wealthy and fattened in the age of the Arab Spring's storms," the newspaper added.